There are plenty of car features that went out the window at some point or another, including ones that were once the only option for drivers. One such feature that fell into obscurity was the classic front bench seat, slowly replaced by convenience and sportiness. Happy Sunday! 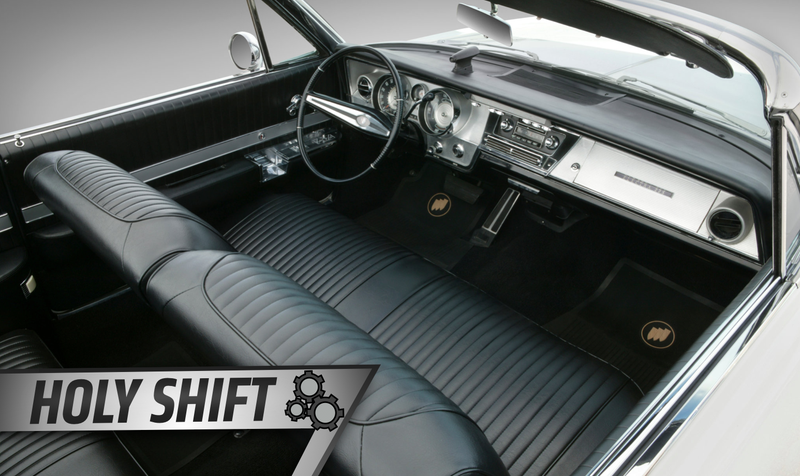 Welcome to Holy Shift, where we highlight big innovations in the auto and racing industries each week—whether they be necessary or simply for comfort—and weird car history. Front bench seats dominated early car history due to being the cheaper and more suitable for additional passengers, and the column-mounted shifter made the arrangement comfortable for that poor sap in the middle. The front bench seat belonged to another era—perfect for slower highway speeds, no seat belts and dates to the drive-in movie theater. But as those things and others changed, so did the looks of the front row of cars. Much like it did with the resurgence of the convertible top, European influences following World War II reshaped the American car industry—and its front seats. Per the New York Times, affordable European sports cars arrived in the U.S. and brought the trend of individual seats to sports cars in the States as well. Contrary to the first Chevrolet model—the 1911 Series C Classic Six—and its bench seats perfect for “those who might want to cuddle at a drive-in movie,” the manufacturer’s first Corvettes favored sporty bucket seats. Also embracing that look were performance vehicles in the late 1950s, and the New York Times cites the next decade as when most manufacturers offered the option for sport trims and bucket-seat upgrades. Split benches came into the picture as well, but bucket seats provided for more storage on top of the sportier look—that division in the middle allowed for the center console, an armrest and the cupholder, which came around in the 1980s. An option for benches hung around all the way up until 2013 in U.S. passenger cars, phasing out for the last time when the Impala got its 2014 facelift. Even in the 2012 Impala LS and LT models, choosing to have a bench seat was at an extra cost—$195 more than the normal price, according to the New York Times. While many Americans raised in the 20th century still think of benches as the conventional form of seating, people who grew up in the bucket-seat era may find them oddly archaic. At its core, the decline of bench seats was simply one of consumer preference and safety. If Chevrolet’s stats apply to a larger audience, around 90 percent of people wanted a sportier look and their own personal space at the front of the car. They got it, too. With the way things are going in the autonomous-car industry, who knows what’s next—perhaps the new cultural staple will be swivel chairs at the front.